"Part Cherokee, part Southern Methodist, but all fighter," Admiral Joseph James (Jocko) Clark, bold aircraft carrier commander and World War II hero, was thus described by the Navy historian Samuel Eliot Morison. The legendary admiral forged a distinguished reputation as a fearless, aggressive leader and brilliant tactician during a 40 year career from service as Deck Officer, to pilot, to Fleet Commander. Admiral Clark served as Executive Officer of the USS YORKTOWN; then he was designated the first Commanding Officer of two new carriers: USS SUWANEE and the new USS YORKTOWN. Later during World War II, he commanded a carrier task group. During the Korean War he commanded TASK FORCE 77, and was eventually assigned as Commander of the Seventh Fleet. During World War I, Admiral Clark served on board the cruiser USS NORTH CAROLINA on Atlantic convoy duty. 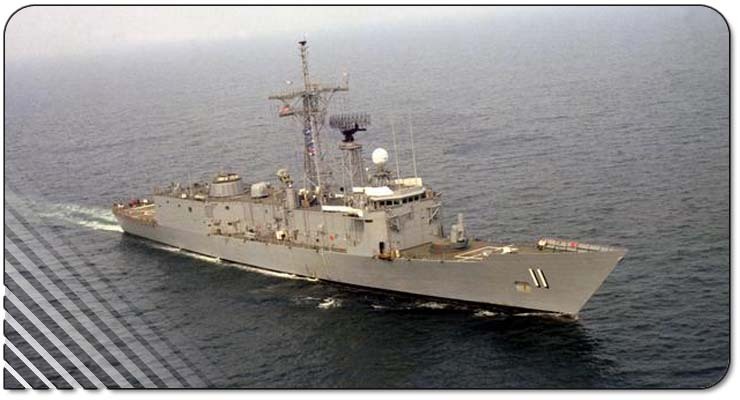 Subsequently, he served on board the USS AARON WARD, which was built at the Bath Iron Works, as was the ship that bears his name. Admiral Clark assumed command of the destroyer USS BROOKS in 1921. In 1925 he was designated a Naval Aviator, and thus commenced the chapter of his career in which he helped to pioneer developments in aviation tactics and doctrine that eventually proved successful in World War II. He was advanced to the rank of Admiral on the basis of the many citations he received in combat during World War II. Admiral Clark retired from active duty on 1 December 1953. He died 13 July 1971 in St. Albans, New York. Description of Coat of Arms: The navy blue and gold on the shield of the coat of arms are the traditional colors of the U.S. Navy and the Academy of which Admiral Clark was a graduate. The pheons (arrowheads) represent the three wars in which he served. The upper pheon and wings allude to the ship's airborne weapons systems as well as to the Admiral's career-long interest in naval aviation and his skill as a navigator and battle tactician. The pheons further are symbolic of the weapons system of CLARK, and the ability to strike the enemy from great distances. The winged sea horse on the crest is a symbol of Admiral Clark's career, relating to his close and long association with the air arm of the U.S. Navy and to his foresight and mastery of the combat tactics of air weapons systems. The thirteen stars denote his World War II campaign participation, the collar bearing the cross represents his highest award, the Navy Cross. The arrowhead refers to his home state of Oklahoma and to his Cherokee Indian heritage; the decresent simulates the initial letter of his last name.